Can You Plant Trees Along Your Fence Line? Choosing the right tree for your property has many benefits. Trees can beautify your property and add to your home’s value. They can block wind, provide shade, and break sight lines. Some even provide homes for birds or grow edible fruits for your family to enjoy. However, when planting a tree in your yard you might find your placement options are limited. There are ways you can plant a tree close to your fence line – you just need to do your research and take some precautions first. 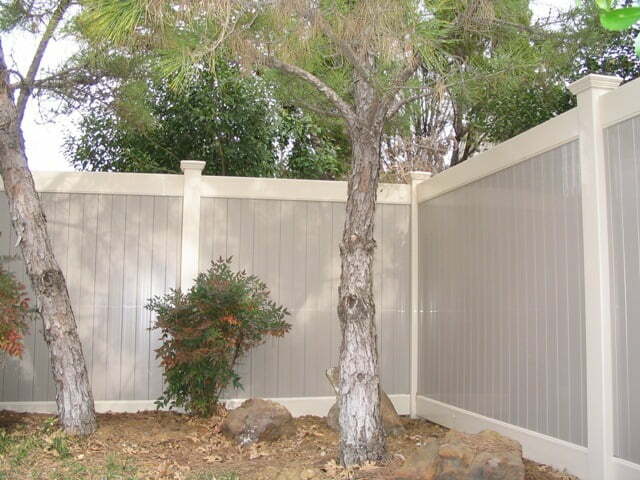 When planting a tree near your fence line, you first need to make sure your chosen tree is “fence-friendly.” You don’t want a tree that will grow too tall or that will grow an extensive network of branches or roots. The best types of trees to grow near fences are those that either stay relatively short or that grow in tall, narrow shapes. Texas Mountain Laurel: This small tree is good for growing in areas that are dry or rocky, as it is extremely drought-tolerant. It features very pretty spring blooms, but pet owners may want to avoid it as the seeds it drops are toxic. Rocky Mountain Juniper: One of the most popular and widely-distributed pine trees in the United States, the Rocky Mountain Juniper is a great choice for most Texas yards. Nurseries can often provide you with a taller, thinner cultivar that is well-suited for growing next to your fence. Texas Red Maple: A popular choice for wetter soil conditions, Red Maple trees grow quickly and provide lots of shade. They are well-known for their beautiful fall color, which ranges from bright yellow to crimson red. The “Bowhall” varietal is a great choice for planting near a fence, since they stay shorter and the crown doesn’t grow much beyond 15 feet wide. Texas Red Oak: If you have more space in your yard and don’t mind the presence of acorns, a Texas Red Oak is a great choice for a landscape tree. These trees vary in size from 30 to 75 feet, but also have low water needs and can tolerate dry soil well. In the fall their leaves turn brilliant red, making them a great choice for adding visual interest. Crepe Myrtle: Though it’s technically a large shrub, Crepe Myrtle can be grown and pruned into an attractive landscape tree with little effort. It is easy to manage and can be grown in a variety of soil conditions. During the spring and early summer it features large bunches of bright pink or purple flowers which resemble crepe paper in texture, hence the plant’s name. Of course, planting a tree near your fence will always pose some special challenges. If you aren’t trying to take advantage of a feature specific to trees, such as extra shade or edible fruit, you might want to consider planting flowers or smaller shrubs instead. Trees are like any other living thing – they have needs and preferences for where and how to grow. Along with choosing a type of tree that is appropriate for growing next to a fence, you’ll also need to make sure your environment can support a tree. The soil next to your fence needs to be well-drained to avoid rot and root fungus, and the area should get plenty of sun so the tree can grow well. If you’re choosing a tree from a plant nursery or arbor, chances are you’ll have a choice between younger seedlings growing in pots and more mature trees with bagged roots. There are advantages to each, so you’ll need to choose which works best for your needs. Planting younger trees is often the best choice if you want a healthy, long-lived plant. When trees are very young their root systems are less developed, making them easier to transport. By planting while the trees are young you give them a chance to grow naturally in your yard, finding the right branch and root arrangement to get the maximum amount of sunlight, water, and nutrients for their growth. However, it could take years or decades before the trees grow enough to be visually distinct or to provide shade or fruit. On the other hand, planting larger, more mature trees can give your house an immediate visual lift and provide quicker benefits in terms of shade, fruit, and privacy. However, these trees often have more trouble staying healthy since removing them from the ground creates some trauma for their root system. Trees that are transplanted later in life often don’t grow as fast or as heartily as trees that grow to maturity in one place. When discussing planting a tree close to your fence, you need to make sure you actually have enough space to plant the tree correctly. You should be able to dig a hole at least twice the size of the root ball and deep enough for the tree’s root system to fit entirely inside. For more mature trees this could result in needing to plant several feet away from the fence itself. Once your tree is planted, you’ll need to care for it like any other garden plant. Recently planted or transplanted trees need lots of water, and many also benefit from tree-specific fertilizer and plant food. You can visit your local plant nursery or many hardware stores to get fertilizer for trees, or read online to find the best type of plant food for your tree species. While planting trees next to a fence is straightforward, caring for them can be difficult. If a tree near your fence gets too large or overgrown, it could pose a hazard to your property. One of the most common causes of fence damage is falling trees and branches due to high winds or storms. If you plant a tree near your fence, you’ll need to maintain it properly to ensure everything stays safe. The first key to good tree maintenance is pruning. Tree pruning requires a good bit of expertise to avoid harming the tree or causing undesirable growth. You can look up guides to pruning and trimming specific tree species online, or talk to an arborist about good tree-trimming practices. 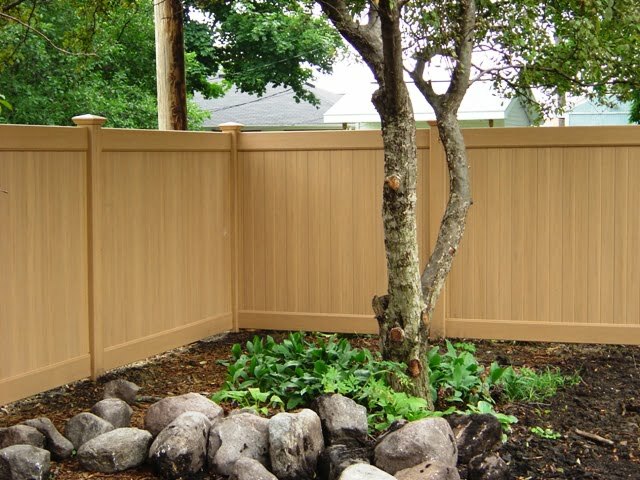 Another common cause of fence problems is tree roots causing the fence posts to shift or lean. There are several ways to fix leaning fence posts without damaging your tree or its roots, but extremely overgrown root systems may need to be cut back so your fence isn’t damaged. Finally, don’t hesitate to cut down trees which could be hazardous to your home or property. While you may love that classic old oak or maple tree in your backyard, a large storm could easily blow it down onto your fence, car, or home. Even relatively small trees can weigh thousands of pounds – if they fall, they’ll easily take out big sections of your fence or damage your home. Future Outdoors is the leading installer of vinyl fences and other fence products in the Dallas-Fort Worth metro. If you’re interested in learning more about installing and caring for your fence or property, call us today at 972-576-1600. You can also visit our Facebook page for more tips and articles from our fence experts.